For some people Nusrat Fateh Ali Khan was the best thing to happen in the field of contemporary music and for many he virtually personified the magic wand of melody. While the purists looked at hirn with a cross eye, the ''trend' setters simply marveled at his innovations. Ustad Wakur Khan the only survivor of Patiala gharana, is closer to the truth when he says that Nusrat Fateh Ali Khan was like a colossus, towering over the vast empire of the music. A few months back mentioning about his family, Nusrat himself said, "The link between this art and me is traceable to four hundred years back when sufis were spreading the gospel of ishaq haqiqi and ishaq mizazi through their melodious Strains. My forefathers learnt qawwali by sitting at the foot steps of the durgahs. From that period onwards, music has continued to be like an unbreakable chain in our family tradition." But Nusrat's father felt that musicians were not respected in the society and wanted Nusrat to make a departure from his ancestral background and join some .other 'dignified' profession like medicine' Understanding his father, Nusrat Khan made efforts to achieve this goal' yet, his obsession with the saat suras was such that in his father's absence, his fingers would automatically touch the harmonium. In his own way and without any extraneous help he used to delve deep in the mystic world of melody'. One such fateful day, he got so lost in unlocking the mystery of music that he failed to notice the presence of his father who came home rather early. A stunned Nusrat feared that his father might have disheartened with this act. To his surprise, Fateh Ali Khan embraced him and blessed him by saying, "you need not touch a stethoscope since you are destined to cure the tortured soul of humanity through the soothing art of music." By this quirk of fate, Nusrat Khan joined his ancestral profession. Under the watchful eyes of his father, he learnt various ragaas and the art to play different musical instruments. This continued for many years, Fateh Ali Khan deliberately refrained from introducing his genius son in his own concerts for he wanted that he should have his own independent identity. And that opportunity too came with the grace of divine power. lt so happened that Pandit Dina Nath, a famous Indian singer of his time and an olci associate of Fateh Ali Khan, went to Pakistan to participate in a cultural show and was staying with Nusrat's family. One day, Pandit Dina Nath confided, to his friend Fateh Ali Khan that he was in a very tight corner as he was unable to find a competent tabla Player for his concert. Indirectly it also meant that he would have to undergo the humiliation of postponing or perhaps cancelling his programme. On realising this hapless position of his esteemed guest, Fateh Ali Khan graciously offered the services of his son Nusrat Khan who could handle all types of musical instruments. He also must have realised that perhaps Almighty has given the opportunity to expose his talented son to the public eye. Fateh Ali Khan's observation pioved to be true. His son grabbed this opportunity with both hands and when the show was ovet, he was lustily cheered. From that very day, a new name, Nusrat Fateh Ali Khan, began, to shine on the vast firmament of music. At this critical juncture, his uncle Mubarik Ali came to his rescue advising him to overcome this shock by rededicating himself to music. Since Mubarik All also wanted to continue the legacy of qawwali recitation, he asked his nephew to fill the void left by Fateh Ali Khan. As the fate would have it, Nusrat Fateh Ali Khan became a substitute to his late father and he started participating in the qawwali concerts. He was gradually recovering his ground when he had to undergo another harrowing experience. This time Mubarak Ali became a victim of the icy hands of death leaving Nusrat Fateh Ali Khan alone in the forest of life. "This time', recalled the singer, "there was none in the family to lend a shoulder for me to cry on. Clearly, I was caught in the queer wheel of the destiny. l was mentally a wreck and the members of our singing group left me one by one. So, besides these twin tragedies, there was another fear, the fear of hunger and starvation which began to prevail in our home. From all sides, it seemed to be the end of the road for me." Though the life in him had temporarily gone, the artist in him was, stilt ative. He fought his way out by invoking the power of music. He began to participate, though in an individual capacity, in qawwali sessions and continued his voyage to explore the new avenues in the rapturous world of symphony. From this point of view, March 23, 1965 had a very special place in his life. On this fateful day, Radio Pakistan had organised a music competition at the national level. Nusrat Fateh Ali Khan, too, along with his associates came to participate. He was practising in a corner of Lahore Radio station when Shakoor Bedil, the producer of the programme passed by and happened to listen his alaap"
Shakoor Bedil was so enchanted by his mellifluous voice that he kept standing there for several minutes and when the composition was over, he richly praised Nusrat. 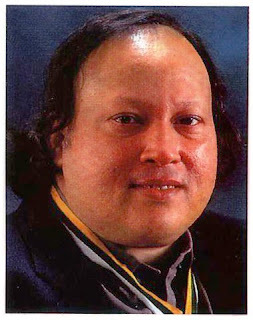 Fie also advised him to lead the chorus because their group leader was unable to create the desired impact"
This was a turning point in Nusrat Fateh Ali Khan's career. He won the critical acclamation from all the judges and was declared as the best singer of that year. 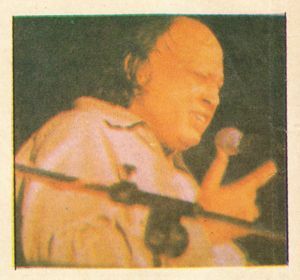 When this judgement was being read, Nusrat Fateh Ali Khan secretly brought out from his pocket a photograph of his late father and by placing it on his forehead he started weeping like a child. Perhaps that was the only way through which he could express this moment of triumph. After this recognition, he continued to scale new heights. His fame spread across the border and particularly in India he began to be considered as the ultimate in perfection, as far as music was concerned. The success story of this great artist is as absorbing as the creative numbers he presented. To begin with, one has to accept the fact that the music was in his blood veins. Even after his death, Nusrat Fateh Ali Khan is regarded as the master of the melody. Unabashedly he had been copied and unethically he is still being imitated by several composers, particularly by Hindi film music directors. However, he did not much bother about these copy cats because he had reached that stage where ripeness is all.